Lately I've been writing a lot of old-fashioned sort of letters. I belong to a few groups on Swap-Bot and we've been exploring different kinds of missives. There have been crossed letters, those written with dip pen and ink, or as a character from a Jane Austen novel and simply pretty letters, written with a fountain pen and sealed with a wax wafer. It's nice to stretch the boundaries of your daily writing habits and I've enjoyed all of these creative letters. For a swap called "Pretty Letter" I wanted to do something special, something I hadn't done before. I remembered a beautiful letter sent to me by my pal Julie and decided to try to recreate the intricate fold she had used. I was delighted to receive such a pretty letter and hope my swap partner will be too. This is the letter I received from Julie. Such a beautiful looking letter. I know you will all want to know how to achieve this gorgeous fold and seal so I thought I would share it with you. I love it because it isn't just a fold and seal, it's a very pretty fold with a lovely seal. 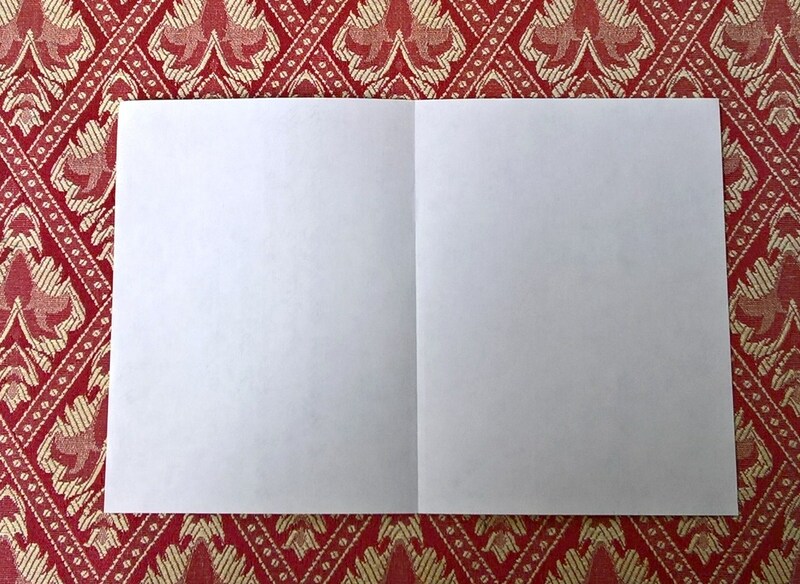 Below is a tutorial on how to fold the paper and set the seals so your letter cannot be opened unless the threads across the opening fold are cut. 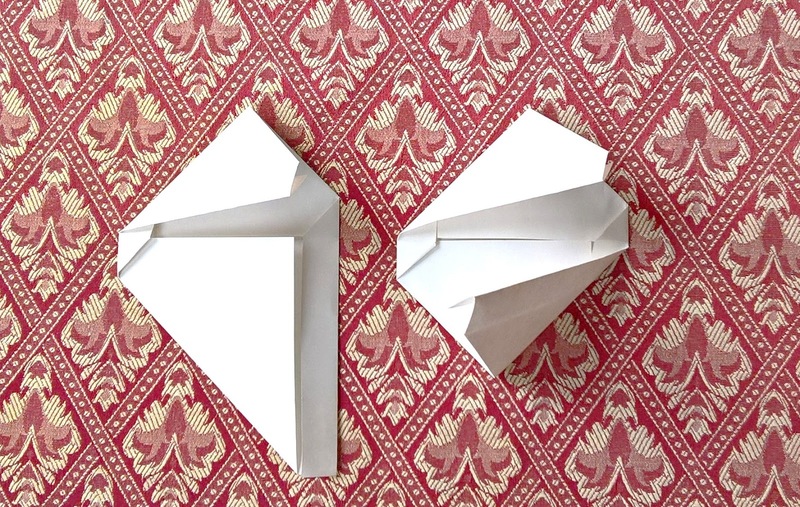 To achieve this stunning folded, sealed letter get a sheet of paper roughly 5 x 7 inches (Google translates this to: A5 size or 48x210 mm (15x21) 5-7/8 x 8-1/4 in ) holding it in landscape orientation, fold it in half. Next fold the bottom corner to the middle fold creating a triangle, rotate 180º and do the same to the other side of the paper. 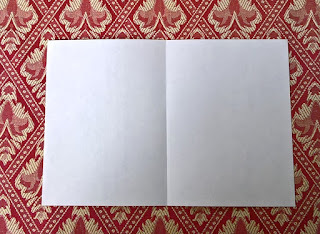 Now fold the side of the paper to touch the edge of the triangle you have just made, rotate 180º and repeat. Once that is done, Fold each side to the centre and you should have a little rectangle-esque shape with a small gap in the middle. 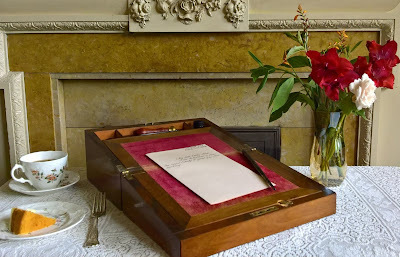 Now that your letter is folded, it's time to affix the seal. Take a length of colourful string about 6" (15cm) long (I used embroidery thread) and make a loop on one side of the gap in your folded paper. 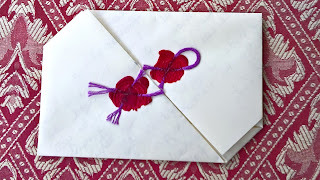 You'll want to put something on the folded letter to hold the folds down while you melt your wax over the string. I used my ink bottle. Melt your wax and drip over the place where the threads cross to make the loop and impress your seal. I need practice getting the right amount of wax and placing the seal. Perhaps Mrs. Duffy will do a tutorial on that! She has a steadier hand than I and her seals always look marvelous. The threads should extend over the gap and then are crossed again and wax applied and embossed leaving two short threads on the other side. Try to get the seal close to the gap, I didn't do this the first time and it caused the folds to slightly open up. Snip the thread so it doesn't overhang the letter. I frayed my edges a little to give interest. Et voilà ! A gorgeous folded and sealed letter that your pen pal will be thrilled to receive. That is absolutely lovely. I have no doubt your swap partner will be delighted. Who wouldn't be? Lovely to hear from you Sonja. I remember receiving this beautiful letter from my pal and it really made my day. I was thrilled with it. Simply gorgeous, I agree Patricia.